Is it too dark to look scrumptious? That is how I remember Mom’s adobo as a young child – mean and dark. Surprisingly, A loves it this way, too. So join me and delve into the dark side of adobo. Pour chicken and marinade into a pan and simmer without stirring for about 10 minutes. Then continue cooking with occasional stirring until the sauce dries up. 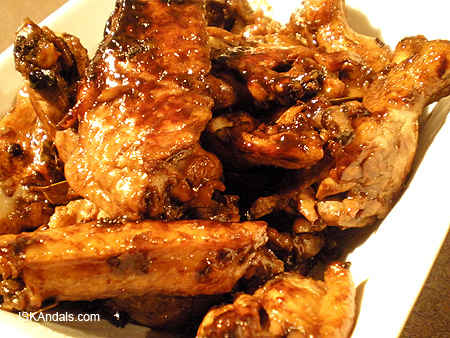 Add cooking oil, sprinkle with few drops of soy sauce and saute for another 5 minutes or until brown. Transfer to a serving platter. Scoop a big bowl of rice and throw into the pan. Add a dash of salt and mix ‘em with the sauce that sticks to the pan. Serve hot with chicken adobo. Sinfully oily yet yummy! Marinating time not included in the above cook time. Iska, i’ll try it this way next time! Thank you. Kumusta na, Iska? That chicken adobo looks absolutely tempting. Biglang mapapatakbo ako sa cafeteria ng wala sa oras! iska i do love cook this kind of adobo..but its kinda good way of cooking….almost the same way of mine…thnks a lot…wow……they really like it…thnks iska ur my angel…..do you believe that one of the secret of cooking is your heart and your soul…i mean your mood in cooking will reflects also the taste of your food….correct me if im wrong…thnks a lot …again and again. These are the dishes I grew up with. 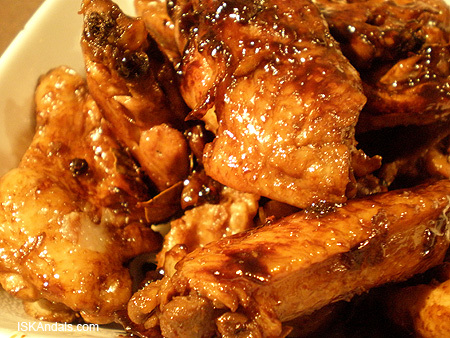 Oh…I love chicken adobo! your recipe is delicious. thank you for sharing! Hi there! 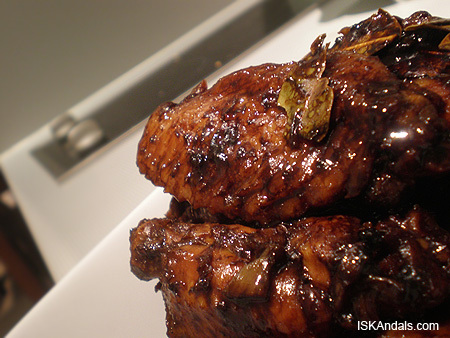 I’m writing a blog entry about Filipino food and I’ve used your adobo picture. I hope you don’t mind. I’ve added photocredits to the entry so people know that the pictures aren’t mine. LOVE the blog by the way! This is exactly how I make my adobo..oily and the sauce is sticky. .-= avatarlady’s last blog ..Congrats To You Azkals! =-. i love all of food recipes her..